There's something about dinosaurs that make little ones roar with excitement! Little Miss loves an outing which features dinosaurs and we thought your little ones would too! 1. 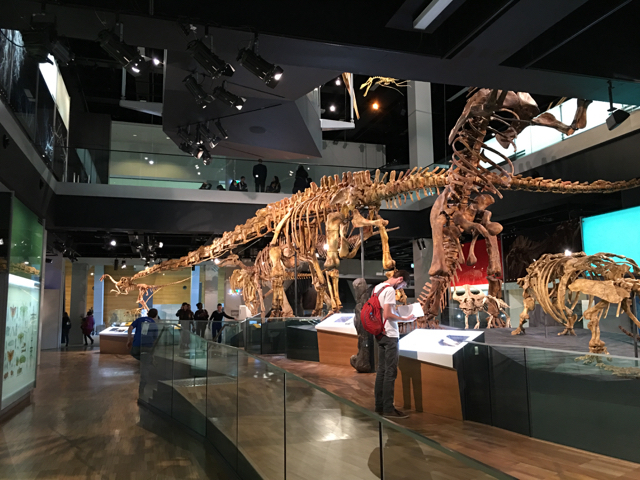 The 'Dinosaur Walk' exhibition at Melbourne Museum is a permanent exhibition showcasing large dinosaur skeletons. To see a virtual representation of the 'Dinosaur Walk', go to the Museum's virtual page. There are also two moving dinosaurs (animatronics) in the section on the right as you walk in the area of the 'Dinosaur Walk' where you'll see fossils and the like. A video of dinosaurs also plays frequently in the little section on the right of the dinosaur walk. 2. The McNish Reserve Dinosaur Playground aka Mimi the Muttaburrasaurus is located on Court Street in Yarraville. Little ones can climb into the belly of the dinosaur and roar through its mouth and slide down the inside of its tail as well as hide inside a dinosaur egg and climb little nets. This playground is a bit limiting as the dinosaur is the only feature there apart from newly installed dinosaur bouncers but is nonetheless a cute dinosaur spot for little ones. 3. The Portasaurus aka Garden City Reserve is located in the corner section bordered by Beacon Road, Crichton Avenue and Tucker Avenue in Port Melbourne. Technically it's a dragon but we will claim as a dinosaur like creature! The main structure includes a slide, a rock climbing wall, bench seating, peek-a-boo holes and a mosaic eye. The playground has features a flying fox, swings and slides and more. 4. Fitzroy Gardens playground is located off Clarendon Street in East Melbourne. The playground includes a cool dragon (which apparently we've been told glows in the dark! ), a giraffe swing set and a sandpit with a nearby lake in the heart of the beautiful Fitzroy Gardens. Ok it's not a dinosaur either but why not, we love creatures at our house! Read our review and tips on the blog now. 5. The Megasaurus Playground is located on Newington Drive in Cranbourne East. The playground includes a flying fox covered by a huge 25m long ‘brontosaurus’ dinosaur frame, a 20m long dinosaur climbing frame incorporating climbing nets and a slide, a ‘pterodactyl’ basket swing with tactile steel feathers which form a ‘cubby house’ and a series of stegosaurus climbing plates with climbing holds that incorporate noise making elements. 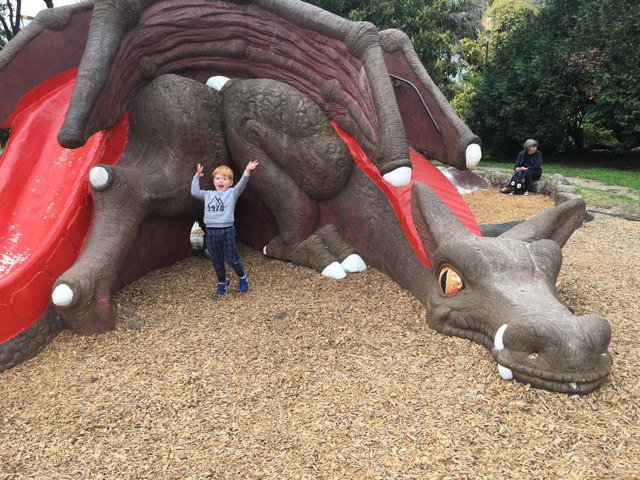 There you have it, a few 'permanent' ideas for your little ones to enjoy Dinosaur spots around Melbourne. Be sure to keep an eye on our blog for any Dinosaur inspired events or exhibitions coming to Melbourne soon. For more playgrounds, go to our dedicated page.